Kenny Jackett has revealed Pompey will scour all markets ahead of their January recruitment. The Blues boss told how he will run the rule over potential targets from a host leagues across Europe as he bids to bolster his side’s promotion push. The transfer reopens in less than 50 days’ time, giving Jackett the opportunity to strengthen any areas of his squad he feels need it. 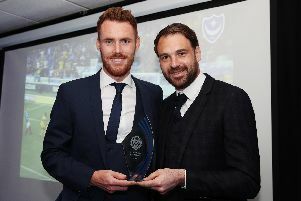 During his time in the Fratton Park hot seat, the ex-Millwall manager has signed players on loan from Premier League clubs – like Wolves’ Joe Mason – as well as unearthing non-league gems such as Oli Hawkins from Dagenham. Jackett has also utilised the international market, bringing Ronan Curtis to the south coast from League of Ireland outfit Derry City. Pompey have again been scanning the Emerald Isle, with Kieran Sadlier on their radar. But the manager has insisted the Blues are looking right across the continent for new faces. Jackett said: 'I wouldn't say players just come from one area, you'd be silly not to look at every single area. 'You try to break things down and be as simple, if you can, putting one person in one area. ‘You try to keep on top of things and put it in context in terms of the standard of the league. 'I wouldn't say we are just looking at the League of Ireland at the moment, though. 'You've got League One, League One loans, League Two, National League and, to a degree, we flirt below the National League, too, but not too much below that. 'And quite a big one is the under-23 leagues. ‘That is a very big area, all of the under-23 leagues – Premier League and Championship. 'There's a lot of players at those big clubs. If you're talking about context and how many people you need to cover it, it's quite extensive. 'After that, it’s all sorts of domestic leagues – Scotland, Ireland and dabbling slightly in Europe. ‘You try to be as comprehensive as you can. Jackett added he believes the growing popularity of the Premier League can help attract overseas talent to Pompey. He concedes, however, there are few foreign players who ply their trade in League One. 'There's quite a lot of foreign players looking to get in to English football now because of the popularity of the Premier League,’ said Jackett.